NAFTA Renegotiation: What's at stake for food, farmers and the land? Download the print copy here. The re-negotiation of the North American Free Trade Agreement (NAFTA) between the U.S., Mexico and Canada begins on August 16, and there is much at stake for farmers and rural communities in all three countries. Despite promised gains for farmers, NAFTA’s benefits over the last 23 years have gone primarily to multinational agribusiness firms. NAFTA is about much more than trade. It set rules on investment, farm exports, food safety, access to seeds, and markets. NAFTA, combined with the formation of the World Trade Organization (WTO) and the 1996 Farm Bill, led the charge to greater consolidation among agribusiness firms, the loss of many small and mid-sized farms and independent ranchers, the rapid growth of confined animal feeding operations (CAFOs) and further corporate control of animal production through often unfair, restrictive contracts with producers. The Trump administration’s negotiating objectives reflect relatively small tweaks to NAFTA, while adopting deregulatory elements of the defeated Trans-Pacific Partnership (TPP). Family farm groups have called for the existing NAFTA to be scrapped and propose a fundamentally new agreement with a goal of improving the lives of family farmers and rural communities in all three countries. The North American Free Trade Agreement (NAFTA) was agreed to by the U.S., Mexico and Canada in 1992, ratified by the U.S. Congress in 1993, and became enforceable in 1994. The Agreement has 22 chapters, grouped into eight sections.1 Those sections cover trade rules on a variety of goods, including textiles, agriculture and food safety, and energy; technical standards for traded goods; government procurement; protection for investors and trade in services; intellectual property; notification of new laws and how to handle trade disputes. NAFTA was the first of its kind in several ways: the first trade agreement among countries at very different levels of economic development; the first to include controversial private arbitration panels that allow foreign corporations to sue governments to challenge actions that impede their potential future profits; and the first trade agreement to include side agreements on labor and environment. It was the template for the U.S.-Central America Free Trade Agreement (CAFTA), the U.S.-Korea Free Trade Agreement, and the defeated Trans-Pacific Partnership (TPP), among others, as well as dozens of other agreements negotiated by Canada and Mexico. Each of the trade deals that followed included additional elements that strengthened corporations’ ability to move production and investments in all participating countries. What promises were made to farmers? During the NAFTA debate in the early 1990s, U.S. farmers and ranchers were promised that they would export their way to prosperity but that didn’t happen. A U.S. Department of Agriculture fact sheet at the time pledged that NAFTA would “boost incomes in Mexico and increase demand for a greater volume and variety of food and feed products” from U.S. farmers.2 The USDA fact sheet vowed that U.S. farmers would gain from “higher agricultural export prices” among other benefits. An International Trade Commission analysis advising Congress in 1993 downplayed the impact NAFTA would have on agriculture, predicting only “a minimal effect on overall U.S. agricultural production and employment,” aside from some increases in grain and meat exports, and a slight increase in fruit and vegetable imports.3 The same ITC report predicted that U.S. Midwest soy and corn farmers would benefit from increased exports to Mexico. These false promises, supported by a compliant media, gave Congressional backers the fuel they needed to narrowly pass NAFTA in 1993. Whether economic gains for farmers or reduced migration from Mexico, NAFTA’s promises of prosperity have proven to be empty ones. What parts of NAFTA relate to food and agriculture? Some exceptions to the free flow of agricultural goods were established under NAFTA. Canada retained the right to maintain its dairy, poultry and egg supply management programs, which support fair prices for Canadian producers and consumers. These programs include some limits on imports and high tariffs for those products. NAFTA also includes a side agreement that expands the volume of Mexican sugar imports into the U.S., while still protecting the U.S. sugar program, which also functions essentially as a supply management program. The Agriculture and Sanitary and Phytosanitary (SPS) Chapter of NAFTA (Chapter 7) sets broad rules for domestic support, eliminates export subsidies, and establishes a mechanism to handle trade disputes. The second part of the chapter focuses on food safety rules, and ensuring that those rules will not act as a barrier to trade. Equivalency agreements between the three countries streamlined inspections of foods crossing borders, and put pressure on inspectors and food safety agencies to facilitate trade. NAFTA also established an ongoing food safety standards committee to settle disputes between the three countries. NAFTA was the first free trade agreement to establish special legal rights for foreign corporations. NAFTA’s Chapter 11 established the Investor State Dispute Settlement (ISDS), which grants foreign investors the right to sue local or national governments over measures that affect their real or potential profits on existing or planned investments.9 This ground-breaking corporate privilege provision has been replicated in nearly every ensuing U.S. trade deal. There have been only a few agricultural ISDS disputes under NAFTA. Cargill, Archer Daniels Midland and Corn Products International have all successfully sued Mexico and won multimillion dollar settlements, for the country’s tariffs on high fructose corn syrup. What is the relationship between NAFTA, the World Trade Organization and the Farm Bill? The rules set in NAFTA (1994), the WTO (1995) and the 1996 Farm Bill are mutually reinforcing. The WTO set a foundation of international trade rules for more than 160 countries. The WTO’s Agreement on Agriculture set international trade rules on agriculture policy, including the types of farm programs that are allowed (non-trade distorting), tariff levels on agricultural goods and how those tariffs may be applied. If NAFTA were eliminated, the trade rules set at the WTO would be the fallback. Shortly following the passage of the 1996 Farm Bill, U.S. farm prices predictably plunged following the expanded production—and tens of millions of dollars of emergency payments were needed to prevent many farmers from losing their farms.13 Those low prices, coupled with NAFTA’s and the WTO’s requirements to lower tariffs, facilitated the rapid growth of agricultural export dumping (exporting below the cost of production) by U.S. agribusiness over the next decade.14 Many Mexican farmers who were particularly hard hit by a flood of U.S. corn exports eventually emigrated to the U.S. to work on farms and in meat packing plants. In 2002, the Farm Bill took steps to convert the emergency payments for farmers into commodity program farm subsidies. These programs, further adapted in ensuing Farm Bills, support farmers when prices drop due to over-production, and continue today in the form of revenue-insurance programs. What are the outcomes of NAFTA? Because NAFTA entered into force around the same time as the formation of the WTO and the 1996 Farm Bill—not to mention the series of free trade agreements that followed—it is difficult to tie precise outcomes in the agriculture sector to NAFTA. But the trends in agriculture post-NAFTA very clearly show the loss of small and medium sized farms, the rapid expansion of CAFOs and contract production in the meat and poultry sector, and the growing power of multinational agribusiness firms across the North American market. 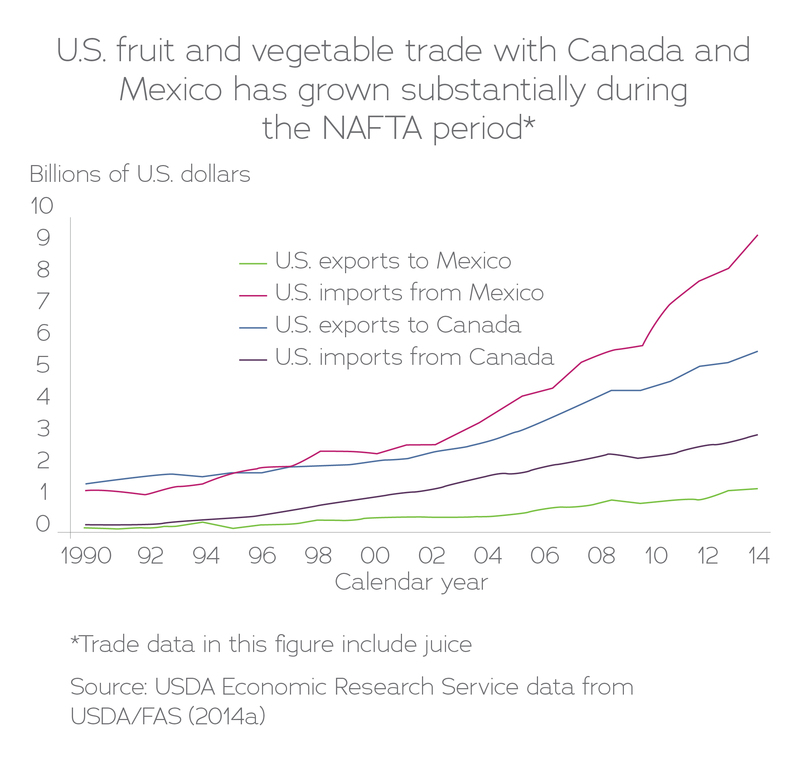 Below we explore outcomes and trends in agriculture and food following the passage of NAFTA. NAFTA has dramatically contributed to the integration of North American agricultural markets, according to the USDA.15 Integration is when formerly separate markets have combined to form a single market. Final food products, like beef, experience integrated markets as well as raw materials like animal feed. The integration of the North American market is perhaps best understood through meat and poultry production. Between 1993 and 2013, trade between the three countries in animal products increased more than three-fold from $4.6 billion to $15.5 billion.20 U.S. beef exports rose 78 percent by volume since 1993, with Mexico being the number one importer and Canada number four.21 The export of animal feed from the U.S. to Mexico’s pork and poultry industries rose in correlation with increases in Mexican pork and poultry production. Beef and pork production itself has become much more integrated between the three countries. The U.S. now imports live cattle from Mexico and Canada to finish and process. 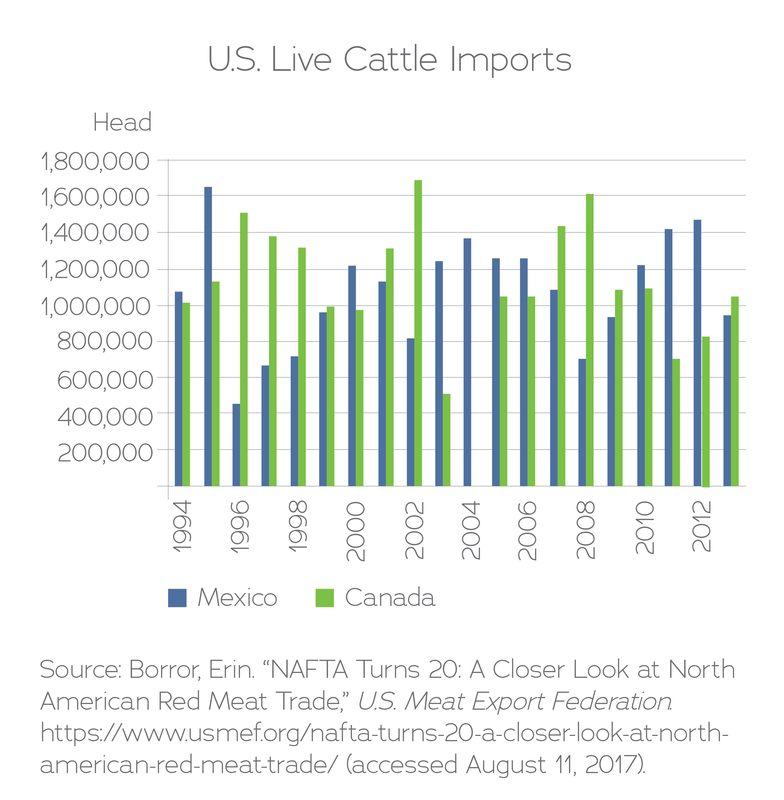 Mexico has averaged about 1.2 million head of cattle exported to the U.S. for fattening and processing each year since 2000.22 These imports of live cattle have allowed the beef industry to depress the market price for U.S. raised cattle. The result is the reduction of the U.S. cattle herd and loss of U.S. cattle ranchers. According to the Ranchers-Cattlemen Action Legal Fund (R-CALF), the U.S. has lost 147,000 live cattle producers from 1996-2009.23 Because Mexico and Canada brought a successful case at the WTO to challenge the U.S. mandatory Country of Origin Labeling (COOL) rule for beef, consumers in the U.S. do not know where their beef was born and raised. Canadian hogs are also brought to the U.S. for slaughter. In 2014, the U.S. imported 3.9 million Canadian feeder pigs.24 These pigs, birthed on Canadian farms, were finished and slaughtered in U.S. The pig products are consumed in the U.S. or exported, often to Canada or Mexico. The integration of agricultural markets has led to a decline in the number of farmers in all three countries. The USDA does not monitor agricultural trade related job loss, and there is no NAFTA Trade Adjustment Assistance program for farmers as there is for some classes of industrial workers. However, USDA data shows a dramatic increase in the number of very large farms and a sharp drop in the number of mid-sized farmers after NAFTA. The loss of many U.S. farms during this period, linked to low commodity prices, is also connected to major changes in meat production. The CAFO model depends on cheap animal feed, often sold below the cost of production. In effect, cheap corn and soy, aided by the 1996 Farm Bill, served as a subsidy for CAFO production, according to research by Tufts University’s Global Development and Environment Institute.29 The expansion of factory farms, particularly in poultry and hog production, has led to most of U.S. meat production coming from fewer, big operations. The growth in CAFOs has coincided with the disappearance of independent poultry and pork producers—now nearly all under contract with multinational meat companies like Smithfield and Tyson. Contract farming has been highly criticized for being unfair to producers, burdening them with up front costs, associated debt, and other financial risks, while not paying fair prices to cover those costs. The dairy industry has also followed the CAFO model. Smaller dairies have been pushed out by lower prices, driven largely by over-production from increasingly large dairy CAFOs.30 One of the driving motivations behind the dairy industry’s active engagement in the TPP, and now NAFTA, is to tear down Canada’s supply management program in an effort to absorb excess milk production from U.S. dairy CAFOs. The reduction of the U.S. cattle herd has also led to the loss of beef processing jobs since NAFTA. According to the United Food and Commercial Workers Union, 50 plants have closed since taking out 52,695 in daily cattle kill capacity after the passage of NAFTA.37 Meat processing in the U.S. had already begun a major reorganization in the 1970s and 1980s, transitioning to fewer, much larger meat packing plants, and moving those packing plants to rural areas where union organizing was more difficult. Simultaneously, poultry processing took off largely in anti-union southern states—creating low-cost competition for the beef and pork industries. The availability of immigrant labor, including from Mexico, aided in the meat industry’s efforts to break the unions and keep labor costs low. 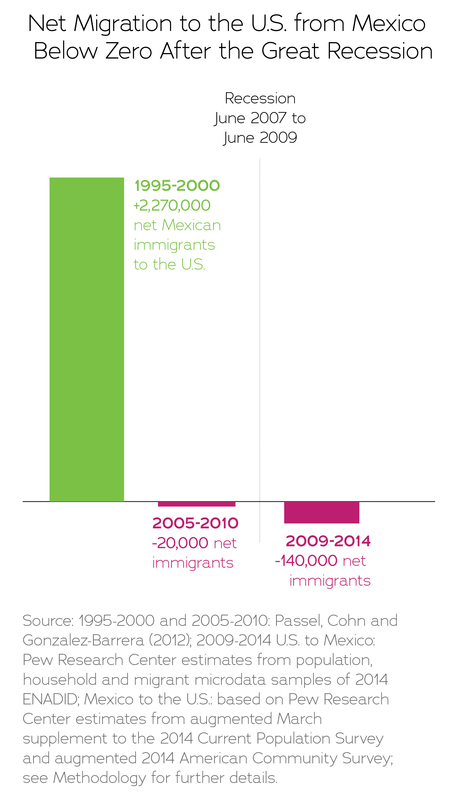 While immigration rules are not explicitly included in NAFTA, there is little disagreement that the trade agreement contributed to rising immigration, and that U.S. agribusiness has benefitted greatly from that development. Since NAFTA, there has been a dramatic increase in agribusiness market share concentration in nearly all sectors including seeds, fertilizer, meat and crop production. Agribusiness concentration levels in U.S. agriculture are high and rising—and as competition declines, farmers and ranchers are vulnerable to agribusiness efforts to depress prices, according to a recent USDA report.43 In addition, it can be difficult for farmers and ranchers to gather market information, i.e., price transparency and price discovery—in highly concentrated markets. Many of the global meat giants have operations throughout North America. For example, Smithfield has pork production joint ventures in Mexico with Granjas Carroll de Mexico and Norson. Brazillian-owned JBS’s poultry division, Pilgrim’s De Mexico, has multiple locations throughout Mexico. JBS, currently embroiled in a major bribery and food safety scandal, is also deeply invested in beef processing in Canada. Cargill, the meat and animal feed giant, has 30 facilities in 13 Mexican states and extensive meat and grain investments in Canada. Just as trade agreements have shaped U.S. farm policy to benefit agribusiness, so have trade deals contributed to the weakening of U.S. food safety rules to benefit food companies. The food safety, plant and animal disease provisions in NAFTA, known as Sanitary and Phytosanitary Measures (SPS), and soon thereafter the establishment of the WTO SPS rules, helped usher in a new era of food safety de-regulation. NAFTA established that Mexico and Canada food safety regulations did not have to be “equal” (or the same as) to U.S. regulations, but rather the more difficult to interpret and verify “equivalent.” The definition of “equivalence” was not part of NAFTA – nor was the requirement that independent government inspectors, rather than meat company staff, do the actual inspecting. Not only did NAFTA establish a food safety template for future trade deals in which trade concerns were given priority over consumer health, it also helped propel efforts to deregulate and privatize food safety inspection in the U.S.
What is the process for renegotiating NAFTA? The President and the executive branch have the authority to negotiate with foreign countries, but Congress must ratify those agreements. The Trump administration must first give Congress a 90-day notice that it will begin NAFTA renegotiation. As part of that notice, the administration must outline its negotiating objectives. Those objectives must also be consistent with trade objectives outlined by Congress in Trade Promotion Authority legislation (also known as Fast Track), which is in effect until July 1, 2021. In July 2017, President Trump announced his negotiating objectives for NAFTA. The objectives were quite vague, and followed very closely the trade objectives previously outlined under the Trade Promotion Authority legislation. For agriculture, the objectives emphasize the need to “maintain existing reciprocal duty free market access,” expand market access by reducing any remaining tariffs, and promote “greater regulatory compatibility.”68 There has been little explanation from the Trump Administration on how it would achieve these goals. The first round of NAFTA negotiations will begin on August 16, 2017 in Washington, D.C. Again, the President and the executive branch can negotiate and come to an agreement with trade partners, and by the letter of the law are meant to consult with Congress throughout, and present the new agreement to Congress for an up-or-down vote—no amendments to the agreement are allowed. Trade negotiations typically take years, although the Trump administration has said it hopes to finish NAFTA by the end of 2017 or early 2018. The Trump administration has threatened to pull out of NAFTA if it cannot reach a satisfactory deal with Canada and Mexico. In that case, the U.S. would have to provide Canada and Mexico a six-month notification of its intention to withdraw. In the case of withdrawal, trade would not come to a screeching halt between the countries. Mexico would shift toward most-favored nation status accorded all WTO members with the U.S., while it is likely that the 1989 U.S.-Canada Free Trade Agreement, which also eliminated most tariffs between the two countries, would govern trade with Canada. Canada and Mexico could continue under the terms of NAFTA in trade between the two countries if they so choose. Aside from the technical process for renegotiation, the lack of transparency and public input into trade policy has been one of the major targets of criticism of past trade deals, including the TPP. Past trade deals have been negotiated largely in private, with a selected delegation of mostly corporate advisors at the negotiating table. Members of Congress are allowed to read the draft negotiating texts only in a secure room with a guard posted. Neither electronic devices nor expert advisors may accompany the Member of Congress, as they try to understand hundreds of pages of rules and thousands of pages of tariff schedules. The Trump Administration gave citizens only a small window for public input on NAFTA and less than a month public comment period (but nevertheless received more than 50,000 comments). The Administration held only a single public hearing on the agreement over three days in Washington, D.C.
What are benchmarks for a new NAFTA? Commerce Secretary William Ross has stated that the TPP should be the starting point for a NAFTA renegotiation.70 But the TPP was rejected largely because it continued a failed approach to trade which benefits corporate and financial interests. The input of rural communities and all affected sectors is crucial to an effective agreement. Public consultations must not be limited to a single hearing in Washington, D.C., as the Trump Administration has done. There should be regional consultations throughout the U.S., including rural parts of the country. The trade negotiations process itself must be made more transparent, as opposed to past trade negotiations, where much of the proposals and text have been kept secret. Future NAFTA documents should be made public to make it possible for meaningful debate on the agreement as it is being developed. All nations should have the right to democratically establish domestic policies, including farm policies that ensure that farmers are paid fairly, and that protect farmers and consumers. Two critical policies essential for ensuring fair trade in agriculture focus on preventing dumping (when imports are unfairly priced below the cost of production) and protecting supply management systems. While the U.S. has existing tools to prevent agriculture dumping imports, it has not effectively applied them. For example, Florida tomato growers have been hit by an influx of Mexican tomatoes since NAFTA, and while several dumping investigations have taken place and temporary agreements reached74 major tensions remain. Mexico has applied antidumping duties on U.S. apples, and against U.S. exports of chicken thighs and legs.75 Additionally, anti-dumping rules don’t apply effectively to agricultural products that are seasonal and perishable, and where only parts of the country might be affected (like strawberries grown in Florida). Supply management programs have been the steady target for elimination in the negotiation of free trade agreements. In the case of NAFTA, the U.S. dairy and poultry industry have long targeted Canada’s supply management system. Poultry companies like Tyson and Pilgrims Pride want some of the gains won under the TPP that weakened Canada’s poultry supply management system to transfer to NAFTA.76 Well run supply management programs help ensure prices are stable, and keep family farmers in business. The United Food and Commercial Workers (UFCW) in the U.S. is supporting Canada’s poultry and dairy supply management system, arguing that higher and more stable prices for farmers and growers is also better for workers. NAFTA created space for what is called “regulatory cooperation”, a process which seeks alignment of regulations, many related to food and agriculture, between signatory nations. But far from ensuring improvements in regulatory processes and systems, regulatory cooperation limits the ability of individual governments to innovate and improve regulations and regulatory systems under the pressure of meeting trade agreement provisions. The chemical industry, including agriculture chemical companies like Monsanto, Dow and DuPont, who favor less regulation of all kinds, are pushing hard for even higher levels of cooperation and streamlining based on risk, rather than a more rigorous hazard-based system.86 The next iteration of NAFTA’s Regulatory Cooperation could be the TPP chapter on Regulatory Coherence which created what amounts to an early warning system for the formation of regulations in all TPP countries, including state regulations. Regulations would then be periodically reviewed to determine whether they are still necessary. A new NAFTA should not undermine or weaken national-level regulations that protect public health and the environment. While NAFTA does include a side agreement on labor, it has been unenforceable and ineffective in protecting workers. The immigration experience of NAFTA and increasingly draconian immigration policies have left the agribusiness sector deeply vulnerable to worker shortages, yet they remain largely unwilling to offer better working conditions. A new NAFTA must establish binding accords to protect farmworkers’ labor and human rights in all three countries. The AFL-CIO is calling for NAFTA to include collective bargaining rights and a strong minimum wage in all three countries—this could have major implications for food companies and particularly the meat processing industry which has almost no union membership in Mexico, and low union membership in U.S. poultry processing.88 The Trump administration’s NAFTA negotiating objectives do strive to move the labor agreements into the main text of the agreement, but otherwise repeat much of the language of past trade agreements that have been largely unenforceable. Climate change is already adversely affecting farmers and rural communities deeply connected to natural resource based economies in all three countries. Policies focused on addressing climate change are in place in all three countries – and more climate policies are in the process of being developed. While the Trump Administration has announced that it will withdraw from the Paris Climate Agreement, both Mexico and Canada remain part of the agreement. And many U.S. states and cities have announced their continued commitment to the Paris Agreement. Thus far, trade rules like those established in NAFTA have taken precedent over environmental and climate goals. Under a new NAFTA each country, state and local government should retain their sovereignty to enact and implement policies designed to reach their commitments under the Paris Climate Agreement. Download the PDF of this paper. 1. North American Free Trade Agreement, Secretariat. Accessed: August 8, 2017. https://www.nafta-sec-alena.org/Home/Texts-of-the-Agreement/North-American-Free-Trade-Agreement. 2. U.S. Department of Agriculture. The North American Free Trade Agreement: Benefits for U.S. Agriculture. 1993. 3. U.S. International Trade Commission. Potential Impact of the North American Free Trade Agreement on Selected Industries. January 1, 1993. https://www.usitc.gov/publications/332/pub2596.pdf. 4. U.S. General Accounting Office. North American Free Trade Agreement: Assessment of Major Issues, Volume 1. September 1993. http://www.gao.gov/products/GGD-93-137. 5. Bradsher, Keith. “Last Call to Arms on the Trade Pact.” New York Times. August 23, 1993. http://www.nytimes.com/1993/08/23/business/last-call-to-arms-on-the-trade-pact.html?pagewanted=all. 6. Hufbauer, Gary, Jeffrey Schott. “North America Free Trade Agreement: Everybody Wins.” USA Today. September 1, 1993. https://www.thefreelibrary.com/North+American+Free+Trade+Agreement%3a+everybody+wins.-a013266589. 7. Suppan, Steve. Mexican Corn, NAFTA and Hunger. Institute for Agriculture and Trade Policy. May 1996. https://www.iatp.org/sites/default/files/2017-07/Mexican%20Corn%2C%20NAFTA%20and%20Hunger.%20By%20Steve%20Suppan.%20May%201996_0.pdf. 8. M. Angeles Villareal and Ian F. Fergusson, The North American Free Trade Agreement, Congressional Research Service, February 22, 2017. 9. Stop Investor State Dispute Settlement. NAFTA. Accessed August 8, 2017. http://isds.bilaterals.org/?-isds-nafta-. 10. North American Free Trade Agreement, Secretariat. Accessed: August 8, 2017. https://www.nafta-sec-alena.org/Home/Texts-of-the-Agreement/North-American-Free-Trade-Agreement?mvid=1&secid=b6e715c1-ec07-4c96-b18e-d762b2ebe511. 11. Dawkins, Kristen, Steve Suppan. Sterile Seeds: the Impacts of IPRs and Trade on Biodiversity and Food Security. Institute for Agriculture and Trade Policy. November 1996. https://www.iatp.org/documents/sterile-fieldsthe-impacts-of-iprs-and-trade-on-biodiversity-and-food-security-november-1-0. 12. Lilliston, Benjamin, Niel Ritchie. “Freedom to Fail: How U.S. Farm Policies have helped Agribusiness and Pushed Family Farmers to Extinction.” Multinational Monitor. July/August 2000. http://multinationalmonitor.org/mm2000/00july-aug/lilliston.html. 13. Ray, Daryll and Harwood Schaffer. The 1996 “Freedom to Farm” Farm Bill. Agriculture Policy Analysis Center. University of Tennessee. January 17, 2014. http://www.agpolicy.org/weekpdf/703.pdf. 14. Murphy, Sophia, Ben Lilliston, Mary Beth Lake. WTO Agreement on Agriculture: A Decade of Dumping. Institute for Agriculture and Trade Policy. February 2005. https://www.iatp.org/files/451_2_48532.pdf. 15. Zahniser, Steven, Sahar Angadjivand, Thomas Hertz, Lindsay Kuberka, and Alexandra Santos. NAFTA at 20: North America’s Free Trade Area and its Impact on Agriculture. Economic Research Service. U.S. Department of Agriculture. February 2015. https://www.ers.usda.gov/publications/pub-details/?pubid=40486. 16. Schaffer, Harwood, Daryll Ray. Trade Deals and U.S. Agriculture. Agriculture Policy Analysis Center. University of Tennessee. December 18, 2015. http://www.agpolicy.org/weekcol/802.html. 17. Zahniser, Steven, Sahar Angadjivand, Thomas Hertz, Lindsay Kuberka, and Alexandra Santos. NAFTA at 20: North America’s Free Trade Area and its Impact on Agriculture. Economic Research Service. U.S. Department of Agriculture. February 2015. https://www.ers.usda.gov/publications/pub-details/?pubid=40486. 18. Clayton, Chris. “U.S. Corn Exports to Mexico Could be at Risk.” DTN. February 14, 2017. http://agfax.com/2017/02/14/u-s-corn-exports-to-mexico-could-be-at-risk-dtn/. 19. Johnson, Renee. The U.S. Trade Situation for Fruit and Vegetable Products. Congressional Research Service. December 1, 2016. https://fas.org/sgp/crs/misc/RL34468.pdf. 20. Zahniser, Steven, Sahar Angadjivand, Thomas Hertz, Lindsay Kuberka, and Alexandra Santos. NAFTA at 20: North America’s Free Trade Area and its Impact on Agriculture. Economic Research Service. U.S. Department of Agriculture. February 2015. https://www.ers.usda.gov/publications/pub-details/?pubid=40486. 21. Mulvaney, Lydia, Megan Durisin. “Cattle Industry `Very Concerned’ About Trump’s Pledge to Renegotiate NAFTA. Bloomberg. February 6, 2017. http://www.westernfarmpress.com/livestock/cattle-industry-very-concerned-about-trumps-pledge-renegotiate-nafta. 22. Zahniser, Steven, Sahar Angadjivand, Thomas Hertz, Lindsay Kuberka, and Alexandra Santos. NAFTA at 20: North America’s Free Trade Area and its Impact on Agriculture. Economic Research Service. U.S. Department of Agriculture. February 2015. https://www.ers.usda.gov/publications/pub-details/?pubid=40486. 23. Bullard, Bill. Post-hearing brief regarding U.S. Tran-Pacific Partnership Free Trade Agreement. R-CALF. March 16, 2010. http://www.r-calfusa.com/wp-content/uploads/trade/100316-Post_Hearing_Brief_TPP.pdf. 24. U.S. National Agricultural Statistics Service. 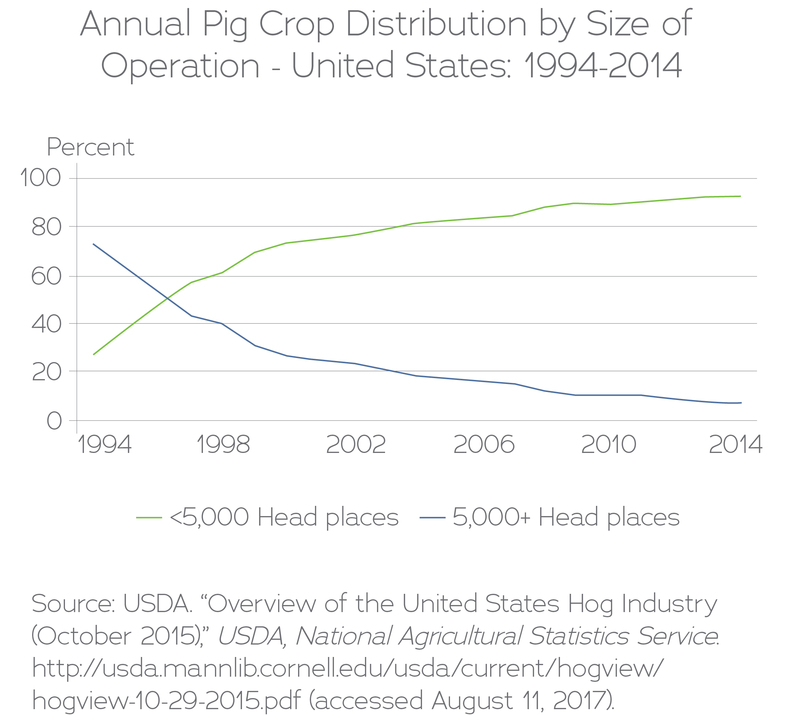 Overview of United States Hog Industry. U.S. Department of Agriculture. October 29, 2015. http://usda.mannlib.cornell.edu/usda/current/hogview/hogview-10-29-2015.pdf. 25. Wernau, Julie. “Trump’s Trade Policies Worry U.S. Cotton Farmers.” Wall Street Journal. February 12, 2017. https://www.wsj.com/articles/denim-dilemma-1486900803. 26. Hagstrom, Jerry. “Tax Idea Concerns Seed Trade.” DTN. January 31, 2017. https://www.dtnpf.com/agriculture/web/ag/news/article/2017/01/31/border-tax-disrupt-flow-seeds-u-s.
27. Burns, Christopher. “The number of mid-sized farms declined from 1992 to 2012, but their household finances remain strong.” Amber Waves. U.S. Department of Agriculture. December 2016. https://www.ers.usda.gov/amber-waves/2016/december/the-number-of-midsize-farms-declined-from-1992-to-2012-but-their-household-finances-remain-strong/. 28. Adjemian, Michael, B. Brorsen, Tina Saitone, Richard Sexton. “Thin Markets Raise Concerns But Many Are Capable of Paying Producers Fair Prices.” Amber Waves. U.S. Department of Agriculture. March 2016. https://www.ers.usda.gov/amber-waves/2016/march/thin-markets-raise-concerns-but-many-are-capable-of-paying-producers-fair-prices/. 29. Global Development and Environment Institute.” Feeding Factory Farms.” Tufts University. Accessed August 8, 2017. http://www.ase.tufts.edu/gdae/policy_research/BroilerGains.htm. 30. Mulvaney, Lydia. Jenn Skerritt. “Spoiling for Canada Fight, U.S. Dairies Push for Trump Deal.” Bloomberg. February 21, 2017. https://www.bloomberg.com/news/articles/2017-02-21/spoiling-for-fight-with-canada-u-s-dairies-push-for-trump-deal. 31. Wise, Timothy, Reforming NAFTA’s Agricultural Provisions. The Future of North American Trade Policy: Lessons from NAFTA, The Pardee Center, 2009. 32. Qualman, Darrin. Losing the farm(s): Census data on the number of farms in Canada. May 16, 2017. http://www.darrinqualman.com/number-farms-canada/. 33. O’brien, Patrick, John Kruse, Darlene Kruse. Gauging the Farm Sector’s Sensitivity to Immigration Reform via Changes in Labor Costs and Availability. American Farm Bureau Federation. February 2014. http://www.fb.org/issues/immigration-reform/agriculture-labor-reform/economic-impact-of-immigration. 34. Lehman, Karen. NAFTA, Mexican Agriculture Policy and U.S. Employment. Testimony before Congress. Institute for Agriculture and Trade Policy. October 28, 1993. https://www.iatp.org/files/451_2_98624.pdf. 35. Weisbrot, Mark, Lara Merling, Vitor Mello, Stephan Lefebvre, Joseph Sammut. Did NAFTA Help Mexico? An Update After 23 Years. Center for Economic and Policy Research. March 2017. http://cepr.net/publications/reports/did-nafta-help-mexico-an-update-after-23-years. 36. Gallagher, Kevin. “What Will Trump Deliver on Trade?” American Prospect. May 10, 2017. http://prospect.org/article/what-will-trump-deliver-trade#.WRMisbUqaB4.twitter. 37. United Food & Commercial Workers International Union, CLC Minority Report to the Agricultural Trade Advisory Committee (ATAC) for Trade in Animals and Animal Products on the Negative Effects of Trans-Pacific Partnership on the Beef Industry. December 3, 2015. 38. Barrett, Rick. “Dairy Farms Fear Trump’s Immigration Policies.” Milwaukee Journal Sentinel. March 6, 2017. http://www.jsonline.com/story/money/business/2017/03/06/dairy-farms-fear-trumps-immigration-policies/98700808/. 39. Fox, Carly, Rebecca Fuentes, Fabiola Ortiz Valdez, Gretchen Purser, Kathleen Sexsmith. Milked: Immigrant Dairy Farmworkers in New York State. The Worker Justice Center of New York/The Workers Center of Central New York. 2017. https://milkedny.org/. 40. Jamrisko, Michelle. “I Need More Mexicans: A Kansas Farmers Message to Trump.” Bloomberg. June 20, 2017. https://www.bloomberg.com/news/articles/2017-06-20/-i-need-more-mexicans-a-kansas-farmer-s-message-to-trump. 41. Karst, Tom. “Industry Leaders Press Labor Issues to House Agriculture Committee.” The Packer. July 13, 2017. http://www.thepacker.com/news/industry-leaders-press-labor-issues-house-agriculture-committee. 43. Adjemian, Michael, B. Brorsen, Tina Saitone, Richard Sexton. “Thin Markets Raise Concerns But Many Are Capable of Paying Producers Fair Prices.” Amber Waves. U.S. Department of Agriculture. March 2016. https://www.ers.usda.gov/webdocs/publications/44034/56926_eib148.pdf?v=42445. 44. Spieldoch, Alexandra. NAFTA: Fueling Market Concentration in Agriculture. Institute for Agriculture and Trade Policy. March 2010. https://www.iatp.org/sites/default/files/451_2_107275.pdf. 45. Meyer, Gregory. “US Farmers Rattled by Trump’s Mexico Plans.” Financial Times. February 7, 2017. https://www.ft.com/content/7016f032-ecf9-11e6-930f-061b01e23655. 46. Wise, Timothy and Betsy Rakocy. Hogging the Gains From Trade: The Real Winners From Trade and Agricultural Policies. Global Development and Environment Institute. Tufts University. January 2010. http://www.ase.tufts.edu/gdae/Pubs/rp/PB10-01HoggingGainsJan10.html. 47. Cargill. Patrick Binger Testifies at USTR NAFTA hearing. June 27, 2017. https://www.cargill.com/2017/cargills-patrick-binger-testifies-at-ustr-nafta-hearing. 48. JBS USA. Comment to the US Trade Representative regarding NAFTA Negotiating Objectives. June 14, 2017. https://www.regulations.gov/document?D=USTR-2017-0006-0883. 49. US Meat Federation. Comment to the US Trade Representative regarding NAFTA Negotiating Objectives. June 18, 2017. https://www.regulations.gov/document?D=USTR-2017-0006-1373. 50. Leonard, Rod. The USDA Plan for Deregulating and Privatizing Meat and Poultry Inspection: A Short History. Institute for Agriculture and Trade Policy. December 13, 2013. https://www.iatp.org/documents/the-usda-plan-for-deregulating-and-privatizing-meat-and-poultry-inspection-a-short-history. 51. Food and Water Watch. USDA Audit Shows Canadian Slaughter Plants Not Equivalent. April 18, 2017. https://www.foodandwaterwatch.org/news/usda-audit-shows-canadian-slaughter-plants-%E2%80%9Cnot-equivalent%E2%80%9D. 52. Public Citizen’s Global Trade Watch. NAFTA’s 20 Year Legacy and the Fate of the Trans-Pacific Partnership. February 2014. https://www.citizen.org/sites/default/files/nafta-at-20.pdf. 53. Government Accountability Office. Additional Actions Needed to Help FDA’s Foreign Offices Ensure Safety of Imported Food. February 27, 2015. http://www.gao.gov/products/GAO-15-183. 54. Marler, Bill. “Why the US Imports Tainted Food That Can Kill You.” The Hill. September 24, 2017. http://thehill.com/blogs/pundits-blog/energy-environment/343444-why-the-us-imports-tainted-food-that-can-kill-you. 55. Zahniser, Steven, Sahar Angadjivand, Thomas Hertz, Lindsay Kuberka, and Alexandra Santos. NAFTA at 20: North America’s Free Trade Area and its Impact on Agriculture. Economic Research Service. U.S. Department of Agriculture. February 2015. https://www.ers.usda.gov/publications/pub-details/?pubid=40486. 56. Wallace, Robert. The NAFTA Flu. Farming Pathogens. April 28, 2009. https://farmingpathogens.wordpress.com/2009/04/28/the-nafta-flu/. 57. Alumbaugh, JoAnne. 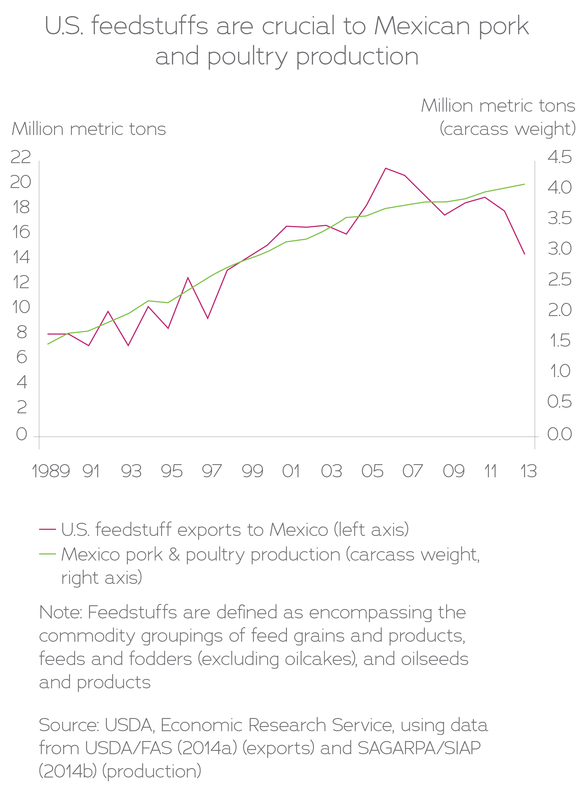 “Mexico Pork Production Expanding Despite PEDv. Farm Journal’s Pork. October 20, 2014. http://www.porknetwork.com/pork-news/latest/Mexico-pork-production-expanding-despite-PEDv----279785622.html. 58. Glen, Barb. “PEDv Strikes Manitoba Hog Barns.” The Western Producer. June 2, 2017. http://www.producer.com/2017/06/pedv-strikes-manitoba-hog-barns/. 59. The Poultry Site. Avian Flu Outbreaks Discovered in Mexico. April 12, 2016. http://www.thepoultrysite.com/poultrynews/36856/avian-flu-outbreaks-discovered-in-mexico/. 60. CBC News. Bird Flu Confirmed on Farm in St. Catharines. July 8, 2016. http://www.cbc.ca/news/canada/hamilton/news/avian-flu-1.3670625. 61. Centers for Disease Control and Prevention. Health Effects of Overweight and Obesity. Accessed: August 8, 2017. https://www.cdc.gov/healthyweight/effects/index.html. 62. Hansen-Kuhn, Karen, Sophia Murphy, David Wallinga. Exporting Obesity: How US Farm Policy and Trade Policy Transformed Mexico’s Food System. Institute for Agriculture and Trade Policy. April 5, 2012. https://www.iatp.org/documents/exporting-obesity. 63. Barlow, Pepita, Martin McKee, Sanjay Basu, David Stuckler. “Impact of the North American Free Trade Agreement on high fructose corn syrup supply in Canada.” Canadian Medical Association Journal. July 4, 2017. http://www.cmaj.ca/content/189/26/E881. 64. Zahniser, Steven, Sahar Angadjivand, Thomas Hertz, Lindsay Kuberka, and Alexandra Santos. NAFTA at 20: North America’s Free Trade Area and its Impact on Agriculture. Economic Research Service. U.S. Department of Agriculture. February 2015. https://www.ers.usda.gov/publications/pub-details/?pubid=40486. 65. Environmental Protection Agency. Sources of Greenhouse Gases. Accessed: August 8, 2017. https://www.epa.gov/ghgemissions/sources-greenhouse-gas-emissions. 66. USAID. Greenhouse Gas Emissions in Mexico. May 2017. https://www.climatelinks.org/sites/default/files/asset/document/2017_USAID_GHG%20Emissions%20Factsheet_Mexico_0.pdf. 67. Environment and Climate Change Canada. National Inventory Report 1990-2015. Accessed: August 8, 2017. https://www.ec.gc.ca/ges-ghg/default.asp?lang=En&n=662F9C56-1#es-4. 68. Office of the U.S. Trade Representative. Summary of Objectives for the NAFTA Renegotiation. July 17, 2017. https://ustr.gov/sites/default/files/files/Press/Releases/NAFTAObjectives.pdf. 69. Feloni, Richard. “Here are the 17 Executives who Met with Trump for his First Business Advisory Council.” Business Insider. February 3, 2017. http://www.businessinsider.com/who-is-on-trump-business-advisory-council-2017-2/#kevin-warsh-distinguished-visiting-fellow-in-economics-at-the-hoover-institute-and-former-governor-of-the-federal-reserve-system-16. 70. Mayeda, Andrew, David Gura. “Ross Says TPP Could Form Starting Point for US on NAFTA.” Bloomberg. May 3, 2017. https://www.bloomberg.com/news/articles/2017-05-03/ross-says-tpp-could-form-starting-point-for-u-s-on-nafta-talks. 71. Food and Water Watch, Institute for Agriculture and Trade Policy, National Family Farm Coalition, National Farmers Union, R-CALF, Rural Coalition. Principles of a New US Trade Policy for North America. Agriculture. January 27, 2017. https://www.iatp.org/blog/201705/principles-new-us-trade-policy-north-american-agriculture. 72. Fortnam, Brett. “NAFTA Draft Notice Includes Language Similar TPP Text on Investment, IPs, SOEs.” Inside US Trade. March 30, 2017. https://insidetrade.com/daily-news/nafta-draft-notice-includes-language-similar-tpp-text-investment-ip-soes. 73. R-CALF. Why and How Mandatory COOL Should be Reinstated Through the NAFTA Renegotiations. May 2, 2017. https://www.r-calfusa.com/mandatory-cool-reinstated-nafta-renegotiations/. 74. Villarreal, M. Angeles. U.S.-Mexico Economic Relations: Trends, Issues and Implications. Congressional Research Service. April 27, 2017. https://fas.org/sgp/crs/row/RL32934.pdf. 75. Zahniser, Steven, Sahar Angadjivand, Thomas Hertz, Lindsay Kuberka, and Alexandra Santos. NAFTA at 20: North America’s Free Trade Area and its Impact on Agriculture. Economic Research Service. U.S. Department of Agriculture. February 2015. https://www.ers.usda.gov/publications/pub-details/?pubid=40486. 76. Nickel, Rod. US Farm Groups Pile on Canada as Trump Eyes Trade Fairness. Reuters. May 4, 2017. http://www.reuters.com/article/us-usa-trade-canada-agriculture-idUSKBN1802PH?il=0. 77. Inside US Trade. Milk Rises to the Top of Trump’s Trade Agenda. April 24, 2017. https://insidetrade.com/trade/milk-rises-top-trump-trade-agenda. 78. Holman, Chris. Milking Scapegoats. Wisconsin Farmers Union. April 19, 2017. http://www.wisconsinfarmersunion.com/single-post/2017/04/19/Milking-Scapegoats. 79. U.S. Department of Agriculture. USDA Announces Plans to Purchase Surplus Cheese. Releases New Report Showing Trans-Pacific Partnership Would Create New Growth for Dairy Industry. October 11, 2016. https://www.usda.gov/media/press-releases/2016/10/11/usda-announces-plans-purchase-surplus-cheese-releases-new-report. 80. Lilliston, Ben. TPP Fine Print: Biotech Seed Companies Win Again. Institute for Agriculture and Trade Policy. November 16, 2015. http://www.iatp.org/ blog/201511/tpp-fine-print-biotech-seed-companies-win-again. 81. Hares, Sophia. Mexico’s Native Crops Hold Key to Food Security, Ecologist. Reuters. June 13, 2017. http://www.reuters.com/article/us-mexico-environment-food-biodiversity-idUSKBN1942KY. 82. Garcia, David Alire. “Monsanto Sees Prolonged Delay on GMO Corn Permits in Mexico.” St. Louis Post-Dispatch. January 30, 2017. http://www.stltoday.com/business/local/monsanto-sees-prolonged-delay-on-gmo-corn-permits-in-mexico/article_eb858f3e-7a1c-50da-9cf5-98eaa3419694.html. 83. Fortnam, Brett. “Ag Groups Seeks Biotech Rules in NAFTA that go Beyond TPP Provisions.” Inside US Trade. June 16, 2017. https://insidetrade.com/daily-news/ag-groups-seek-biotech-rules-nafta-go-beyond-tpp-provisions. 85. Fortnam, Brett. “Industry, Labor Groups Begin to Lay Out Priorities for NAFTA Renegotiation.” Inside US Trade. May 19, 2017. https://insidetrade.com/daily-news/industry-labor-groups-begin-lay-out-priorities-nafta-renegotiation. 86. American Chemistry Council. Joint Statement by ACC, CIAC and ANIQ on NAFTA. May 1, 2017. https://www.americanchemistry.com/Media/PressReleasesTranscripts/ACC-news-releases/Joint-Statement-by-ACC-CIAC-and-ANIQ-on-NAFTA.html. 87. Kitroeff, Natalie. “What’s on the Table in a NAFTA Negotiation.” Los Angeles Times. April 28, 2017. http://www.latimes.com/business/la-fi-nafta-negotiation-20170427-htmlstory.html. 88. AFL-CIO. NAFTA Negotiation Recommendations. June 12, 2017. https://aflcio.org/sites/default/files/2017-06/NAFTA%20Negotiating%20Recommendations%20from%20AFL-CIO%20%28Witness%3DTLee%29%20Jun2017%20%28PDF%29_0.pdf.